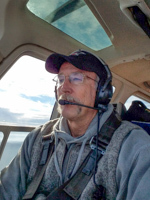 Always having had a passion for aviation, I learned to fly at an early age,obtaining my private fixed wing rating while still in high school at 17. After high school, I joined the Marines and became interested in helicopters. After serving in the Marines, I attended a flight school in Colorado and obtained my commercial helicopter rating. My career has spanned 30+ years and 12000+ hours. I have had the opportunity to fly numerous types of helicopters in a variety of different missions. When asked if I enjoy my job as a helicopter pilot, my reply is always "it beats working for living" and it truly does. I enjoy what I do and am grateful for the opportunities I've had and to be a part of the HeloAir team.